A few months ago, while passing through Illambazar, my friend & I stopped to photograph the hand-lettered signage in the town. The road to Illambazar goes through villages, stretches of cultivated land & a forest of tall monolithic sal trees. After the harvest season, you will find villagers laying out rice grains on the road to dry. It’s not hard to imagine that some grains are blown off the asphalt & scattered as the vehicles fly by; because when it rains, young shoots of rice plants grow on the hard roadsides in thin green patches that look like grass. In fact, they are grass. But when you uproot a tiller you find the dry rice husk, emptied, depleted, still attached to the root. They don’t usually survive, but it fascinates me how easily life returns to the folds of the wild. Many years ago, on the dry, sandy earth by the Ajoy river near the very town of Illambazar, someone showed me a small shrub with pinnate leaves & tiny pink flowers: it was an indigo plant, growing secretly in a wild briar patch. No longer pampered as a cultivar, the plant in the wild still stood a clue to the history of the region. Illambazar grew into something of a trading center a couple of centuries ago. In the 18 century, the English geographer James Rennell described the area as a cotton producing region. But much of the development in the region happened in the 19th century, when the region became a center of indigo cultivation. One of the factors was the town’s nearness to the river. Today, throughout most of the year, the Ajoy is but a call of rills, barely flowing, barely streaming through the sand. 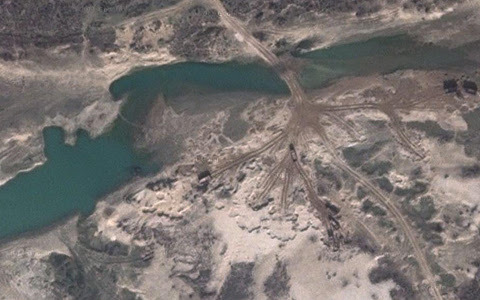 On Google Maps, one will find the traces of loader trucks descending deep into the riverbed to quarry sand. One assumes that Ajoy was less of a seasonal river centuries ago. Large wooden freights carrying shellac, indigo, cotton & tussar silk produced in the region regularly sailed its water eastward where the flow merged with the Bhagirathi near the ancient river port of Katwa. (Above) The river Ajoy by the town of Illambazar; Google Maps. (Above) Trucks quarrying sand from the river; Google Maps. The arid lateritic patches around the region still grow the trees (polash, kul, sal) that the local people harvested a century ago for resins & lac. The shellac was processed locally in the factories of the Erskine family, who also controlled majority of the indigo trade. One of the more popular lac-based products of the region was alta, the crimson lac-dye, used by women to color their feet. Most of these industries & local crafts have ceased long ago. Illambazar today is a trading town on the Indo-Bangladeshi cattle route. In its unplanned growth and crowdedness the town is not unlike any other small town in India, adding to the general drift of seeing it as a town in decline. Yet, in spite of its success as a trading center in the past, I doubt if it ever really prospered: there was clearly a handedness, inequality, to the town’s economy. One can’t look past the excesses of the indigo trade either. Besides, there is always a risk in reducing a town’s life to mere fiscal scrutiny: watching Illambazar renew itself daily in its markets & squares through its transactions of generalities—both human & commercial—only reveals how at its most basic, life eludes our indices. 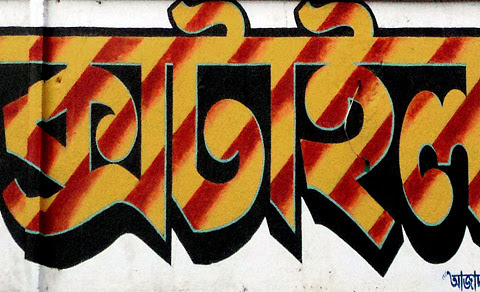 Tomader kaj amar darun valo laglo..